If you’ve ever had a psychic reading, you’ve probably found that any psychic’s methods are completely different from another’s. Every psychic has unique gifts. So it’s important to remember that the way your chosen psychic conducts your reading will differ from another psychic’s approach. If you were to attend a different psychic’s reading, that psychic’s methods and approach will likely be different from any others you visited. Some psychics use tools when they conduct readings. They do this to help increase the accuracy of their readings. Crystals are common tools psychics use to better connect to the spiritual realm when conducting readings. Crystals have been around since the planet came into existence, and lots of people believe that they’re capable of holding lots of power deep inside. Since crystals are so inherently connected to the earth, many psychics believe that crystals can help them conduct accurate readings and more easily connect to spirits. Psychics who attempt to contact a client’s loved one who has passed might use crystals to encourage the spirit to enter the room. 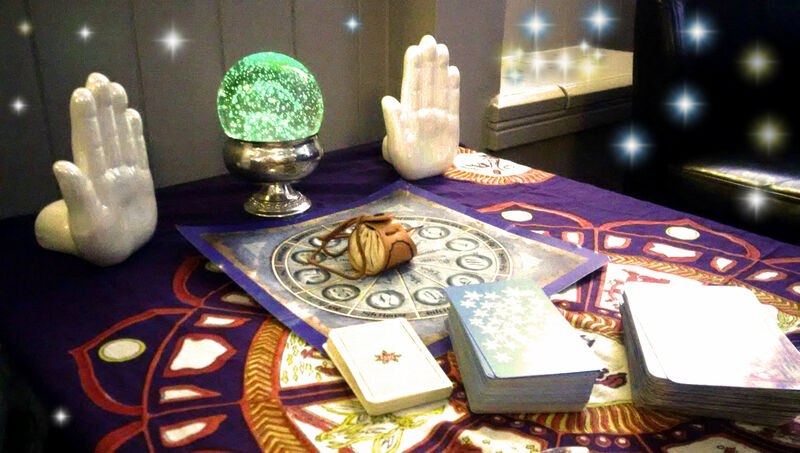 Some psychics hold crystals in their hands, while others arrange the crystals around the room to create a natural gateway for the spirits to enter through. The crystal ball is another tool that is commonly used in psychic readings. Crystal balls may seem overly stereotypical, but psychics have been using them for hundreds of years. Psychics who use crystal balls believe that they can look into one to see events from both the past and the future. Psychics are able to draw from these phases of time to help clients get over the past and move forward on their life path. People visit psychics for a wide variety of reasons. Some people want more direction in their lives, while others have reached a crossroads and are looking for advice. Still others may be facing grief or a particularly devastating situation that has resulted in personal tragedy. Seeking help from a psychic can encourage them to see there’s light at the end of the tunnel and that they can move past the difficult event. Some psychics use a crystal ball to gain insight into their client’s future and see what may lie ahead for them. The psychic may offer advice on the person’s love life and relationships, or the reading may focus more on the issues with family members or on possible career paths. The outcome of your psychic reading can’t be guaranteed up front. Psychics can attempt to focus their attention on a certain issue in your life, but they instead are confronted with a different, more pressing concern which they then communicate to you. Whatever the outcome of your psychic reading, try to enjoy the experience and embrace it.